In 2011, marine biologist and accomplished underwater photographer, Richard Smith completed his PhD on the biology and conservation of pygmy seahorses, a little known group of miniature seahorses resident in the waters of Wakatobi. A great deal of Dr. Smith’s research, which focuses on the gorgonian-associated species, Denise’s (Hippocampus denise) and Bargibant’s pygmy seahorses (H. bargibanti), was carried out at Wakatobi Dive Resort. At one point he found the Wakatobi House Reef had the largest local population of pygmies, and Kollo Soha, a site located north of the resort off Tomia Island, had the greatest proportion of gorgonians with pygmies living on them. The following trip report was compiled by Dr. Richard Smith during a visit at the resort; as it is still relevant we find it of particular interest and an excellent recap of how, why, where and when four species of pygmy seahorse were identified and documented in the waters of Wakatobi. This has been another productive trip, although I have had a slight set back to my behavioural observations. A couple of days of unseasonable and unusual conditions, quite localised around the vicinity of my gorgonian, led to some damage of the gorgonian and the loss of the two females of my study group. A single male remains on the gorgonian and is pregnant so I hope to observe the birth at the beginning of next trip. In addition I have been continuing population surveys at Teluk Waitii and Galaxy dive sites. I have found several pairs of Denise’s pygmy seahorses (Hippocampus denise) so far and will continue with these surveys over the coming weeks. I also plan to survey Cornucopia and possibly another site in the future to expand the area of my study. A new phase of my study is observing the interactions between divers and pygmy seahorses. I hope to establish which specific diver behaviours are stressful to the fish with the aim of creating a code of conduct for diving with and photographing pygmies. I am sure we all wish to continue to appreciate these amazing animals without stressing them or possibly even reducing life expectancy. My pygmy seahorse presentation was again very popular and hopefully gave the audience a glimpse into the private lives of pygmies. Many of the guests were very enthusiastic about seeing pygmies and keen to keep their impacts to a minimum. This year I have expanded the part in one of my presentations regarding photographers and tips for getting good pictures without having a negative impact of the reef’s inhabitants. It is always great to see guests embracing this and sharing the Wakatobi philosophy of reef preservation. Ease of access and sheer diversity on the house reef has been vital for my studies as this is where I carry out much of my observations. Wakatobi is one of the best places for pygmy seahorse research in terms of number of species and their abundance (we frequently see Denise’s, Bargibant’s and Pontoh’s, as well as the recently described pygmy pipehorse, Kyonemichthys rumengani). Ease of access and sheer diversity on the house reef has been vital for my studies as this is where I carry out much of my observations. During my time at the resort I plan to continue with my behavioural observations with a new group and conduct further population surveys at two or three more local dive sites. Having had the chance to make preliminary analysis of my previous data I found that the House Reef had the largest local population of pygmies and Kollo Soha had the greatest proportion of gorgonians with pygmies living on them. I was also studying how pygmies use the space on their gorgonian host. 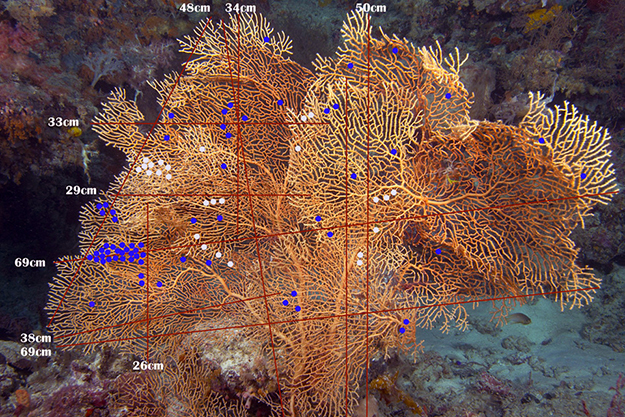 Every time I made behavioural observations I also recorded each individual’s location on the gorgonian and then compared how spatial use varied between reproductively and non-reproductively active males and females. This trip I spent several dives on the House Reef finding a new group of Denise’s pygmy seahorses, which I will get to known intimately over the coming weeks. I have been looking for a group with a greater number of females compared to males. I found such a group on the House and have begun recording their social and reproductive behaviours. The tides have been perfect for dawn observations so I have been at the fans very early over the past few days. I have also been going out on the day boats to establish which sites will be good for population surveys. I think Pinki’s, Teluk Waitii and Fan 38 East are potential candidates having already surveyed the House Reef, Pockets, Kollo Soha and Blade during my last stay. I have also been conducting a series of evening presentations, which many guests have attended. They cover my work, conservation and coral reef biology and biodiversity.